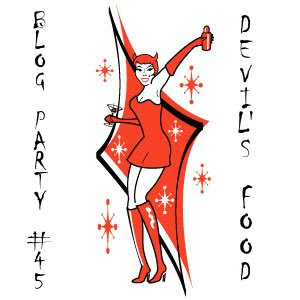 For this month's Blog Party theme, our host and Blog Party founder Stephanie at Dispensing Happiness has gone to the dark side with Devil's Food, our most wicked and tempting dishes and things that we crave. In Stephanie's words, "the things you love most & tell yourself you shouldn't have...but want desperately." So why deviled eggs? I happen to love the little buggers and I am always excited to see them at a party as they appeal to the part of me that craves something creamy and indulgent. With spring, Easter and leftover eggs, I was craving them at least somewhat desperately too. There is a great little indoor/outdoor cafe up at The Contemporary Museum in Honolulu that has the best deviled eggs appetizer with assorted and unique toppings that vary each day. They took it off the menu for awhile but had to return it due to popular demand. I took inspiration from them and created some indulgent, Blog Party worthy deviled eggs with some fun ingredients I found in my fridge and pantry. (This is a great way to use up little bits of yummy leftovers). I made the egg filling basic but delicious, with some homemade mayonnaise, a bit of stone ground Dijon mustard, salt and pepper and then spooned on the assorted toppings. All were yummy but the capers and lemon zest and the crisped prosciutto and Parmesan were the favorite toppings. Nothing is better than some fresh tart/sweet homemade lemonade, made a bit devilish by adding some fiery sliced Thai "bird's eye" chili peppers and a shot of icy vodka if you indulge, plain if you don't. I like to throw it in the freezer for a bit so it is perfectly frosy and cold. And finally (after you finish the lemonade please! ), what do I most crave when I want to go to the dark side and indulge myself? Chocolate of course! I got a small basket of beautiful, fresh local Kula strawberries at the farmer's market this weekend. Although they are sweet and delicious on their own, sometimes you need to be a bit bad and dipping them in good, dark chocolate takes them over the edge. The perfect easy, fun and decadent pupus for my favorite monthly blog event! If you want to join the party, RSVP to Stephanie by this Friday. You can get the details on Blog Party (and check out the round up after the party) on her site, here. I am sooo craving devilled eggs right now. That drink looks wonderful too, love the Thai chilies in it. And you added dessert! What a great guest you are! I will sit next to you. Your egg toppings are so delicious and creative!! Your fiery lemonade sounds delicious and the strawberries-yumm!!!! What a fun blog party! I LOVE LOVE LOVE deviled eggs, and my four year old does as well. Sometimes I feel like she can put down more deviled eggs than Cool Hand Luke. I love the toppings on yours; I've made boring deviled eggs in the past, and you've inspired me to branch out a little bit! Your platter of devilled eggs looks terrific. I could do with one now! How cool that you took such a retro appetizer and totally updated it? I do love deviled eggs - we always had them at parties when I was growing up. I don't think I've ever tried deviled anything, these sound delicious! I ADORE dark chocolate covered strawberries...they are my dessert of choice at the moment. I must have eaten about 10 of them at the Cornell Re-visit Weekend. I just made some deviled eggs and want to post them but yours are so creative...such a great idea!!!! Oh my god that looks good! I also love a devilled egg, and lemonade with chilli (and vodka) sounds like just my affair.